New York City, like many other municipalities, has a citywide reading program in which everyone is encouraged to read one particular book in order to establish literary common ground. But it has done something different in the current go-round: All five nominated books are by women. 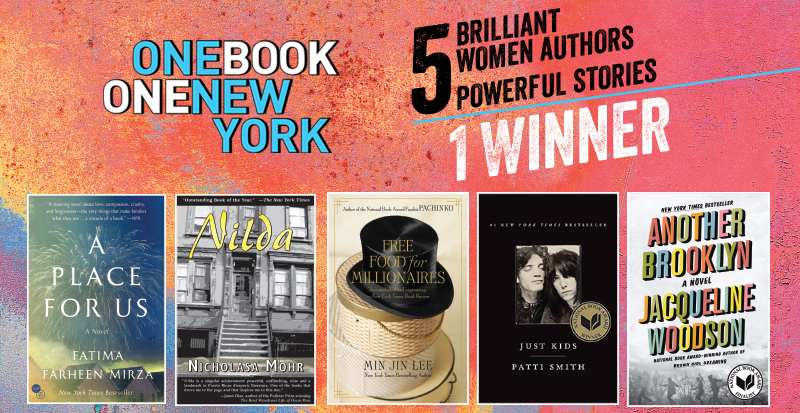 Voting takes place from April 1-30 at nyc.gov/onebook. The winner will be announced on May 3. You can follow the discussion on Twitter at #OneBookNY. On April 23, four of the authors and Nicholasa Mohr’s son David Mohr will participate in a panel at the NYPL’s Celeste Bartos Forum. I’m rooting for A Place for Us because Lee, Smith, and Woodson have already had smash bestsellers, established their names, and won many awards. A Place for Us is a wonderful and timely novel that is doing well for a debut, but deserves a wider audience. I’m not familiar with Nicholasa Mohr’s Nilda, so I can’t express an opinion on it.